In a perfect world ever woman will go into labor at the perfect time. It will be like a ROM COM, your water breaks, you yell, "it's time" and you go to the hospital where you labor in peace, complication free and go home looking like you did your freshman year in college, flat stomach, no eye bags. But, sigh, it doesn't work this way. With my first son my water broke in the wee small hours of the morning. We went to the hospital and then... nothing. Because of the risk of infection after the water breaks I let medicine intervene. Bring on the pitocin. Almost 20 hours after my water broke, baby boy was here. But this time I was pregnant, and pregnant and pregnant. The photo above is me at Easter. Notice my nose? And here I am a week before my due date. Notice my flip flops?? 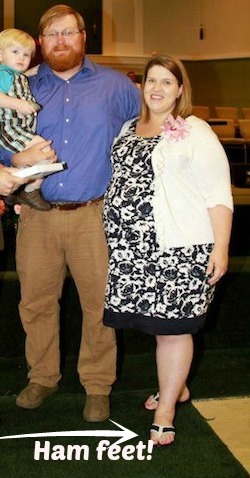 About a month before my due date in this one. By the time my due date, May 18, got close I was miserable. I could hardly walk. I was in so much pain as the baby seemed to drop lower and lower. I swore he was just going to fall out. 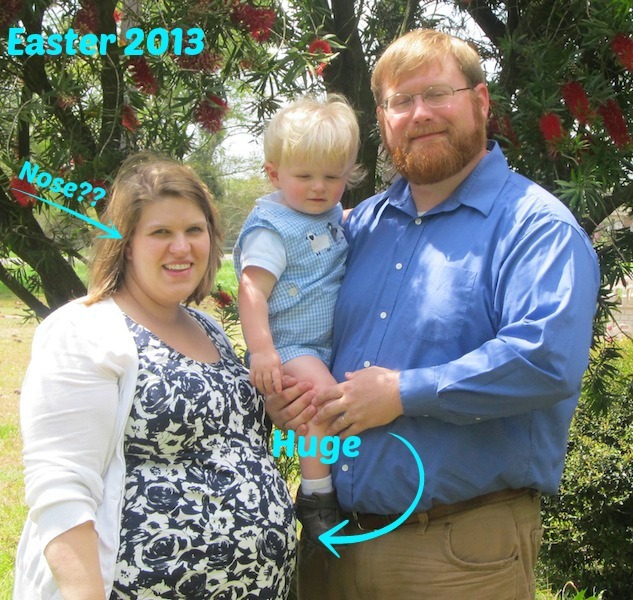 A week before I was due the nurse practitioner said "I'm worried about how big he is. Do you want to talk induction?" No. I didn't want to talk induction. I wanted this baby to come on his own without medical intervention. With Ry I had terrible back labor and I blamed that on the pitocin. I also had some icky issues I am not going to get into here that were the result of a long labor. Cut to two weeks later. Seriously. I was still pregnant. "Okay," I said. "Let's do this." So, nine days after my due date I was induced. I had no back labor, my contractions were mild and 20 minutes after "push time" Isso was here. I am not advocating for induction, I am not saying they are good or bad. But each of us needs to make our own decisions. However, I think there are some things you can do to prepare. 1. Pray. I prayed that I would not have back labor. I prayed that I was making the right decision and I prayed for the baby's safety. 2. Make plans. Because I was induced I was able to plan for Ry's care while we were at the hospital. I was induced on Memorial Day so my mother and father were at home and able to keep him. Also, my husband (who works nonstop) was able to take the day off. 3. Rest. I knew the baby could come the weekend before I was induced that was fine, but I was pretty sure he wouldn't. I was able to take that last weekend to prepare myself and my home, spend time with my boys and just rest. 4. Make educated decisions. I would love to have just gone into labor. I would love to have had no medical intervention. But it didn't work that way for me and I had a HUGE baby. I can't imagine waiting any longer than 41 weeks and 2 days. What about you? Did you plan your birth? Or did you wait the course?